InPlace provides interactive access to any location via the Internet. Our full service solution makes creating and publishing virtual tours the easiest and most convenient process available. We capture, publish and host all Netvisits™ virtual tours which are availabe 24 hours a day and are accessible through any web browser. Internet users simply find your location, click a button provided by InPlace, and are then instantly touring your location. Simply call us to schedule an appointment, meet the photographer at the scheduled time, and we'll do the rest. InPlace works with you or your webmaster to integrate NetVisits™ virtual tours into the sites where you'd like them to be seen. Integrating NetVisits™ into your own site is so easy that we can walk even a novice through the process quickly. 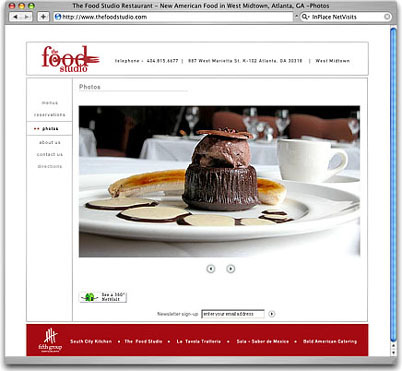 Fifth Group's, The Food Studio in Atlanta Georgia integrates NetVisits™ virtual tours into their website. Copyright © 1996 - 2019 InPlace NetVisits. All rights reserved.